Sitting at lunch on Friday a colleague remarked, “We don’t like turkey, it’s just too dry.” This reminded me of the epic “National Lampoon’s Christmas Vacation”, “Home for the Holidays”, and all the other movies that feature infamous turkey moments of one kind or another. It always strikes me as strange. My home is more reminiscent of what we fondly call the “Shoot Your Eye Out” move, aka “A Christmas Story”, in which the patriarch famously lusts after the family turkey until deprived by a pack of dogs. In our home it is the matriarch who lusts after the bird and I am the cook and guardian of the pending feast. To summarize, we love turkey. We love it year round and at Thanksgiving we celebrate the regal fowl by roasting it with elegant simplicity. Here, in a nutshell, is how. Buy a fresh, never frozen turkey. The quality of your turkey may vary significantly by vendor, whether it is a Tom or a Hen (male or female), and size. I have not had the best luck with gigantic mutant turkeys over twenty pounds. Resist the temptation and, if necessary, buy two average birds. As for gender, Toms are usually tougher and have a slightly different taste. They are also usually cheaper. Brine your turkey. This consists of dissolving salt in water and soaking the bird for up to but never more than eight hours. Cooks Illustrated has a great pdf explaining the technique and mechanics of brining: http://www.cooksillustrated.com/images/document/howto/ND01_ISBriningbasics.pdf I will describe how I brine in a moment. Note: Remove neck and giblets from body and neck cavities of turkey; discard or refrigerate for another use. Organize the kitchen to roast the turkey. Obtain kitchen twine to truss the bird, locate or fabricate a covered roasting pan and an oven safe roasting thermometer. Assuming you have brined your turkey you will preheat your oven to 325. Brush turkey lightly with melted unsalted butter (NOT margarine). Roast turkey according to weight and remove cover for last 1/2 hour of cooking until meat thermometer reaches 180-185°F when inserted into the deepest part of the thigh. I brine by removing gibblets, rinsing the turkey and preparing 1 quart of brine per pound of turkey (enough to cover bird in my oversized pot). The brine is 1/2 cup sugar and 1/2 cup Diamond brand kosher salt to 1 quart of COLD water. 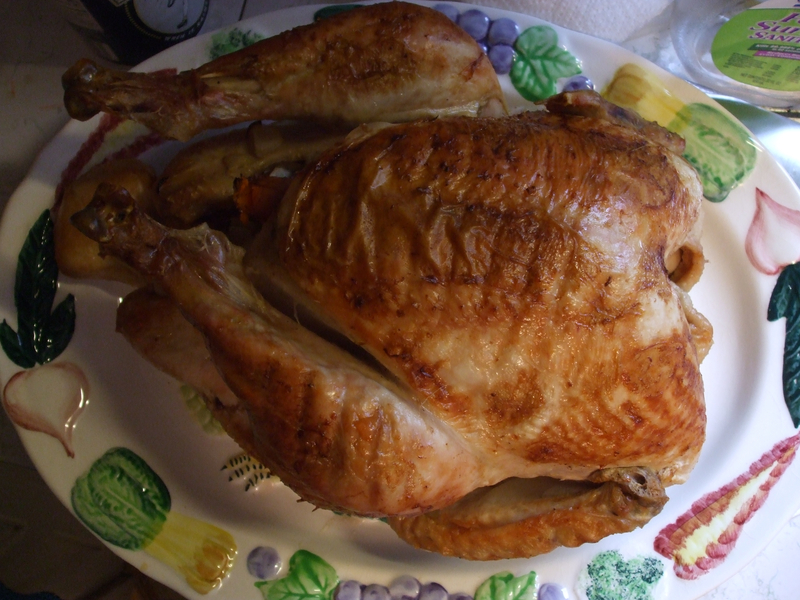 You can use warm water to make the brine but be sure to chill the water BEFORE brining the turkey. Keep the turkey COLD while brining (refrigerate).